The ethnic problem did not end with the war. The ethnic problem has to be resolved to make peace work and prevent the next war. Development, democracy and devolution: that was the Premadasa plan to resolve the ethnic problem. President Premadasa believed that to make Tamil people feel like Sri Lankan citizens, a power-sharing arrangement, restoration of democracy and rapid economic development were equally necessary. Eelam illai; Ellam kudutharei – Not Eelam but everything else – that was his solution. The LTTE has been defeated totally. But in order to prevent it from raising its head again, a similar plan is needed urgently today. The Premadasa efforts to win over ordinary Tamil people took place in the middle of the war. There was a Presidential mobile service in Vavuniya which gave people of the area a chance to tell their problems straight to the President, the ministers and top officials. Several garment factories were set up in the North and the East as part of the 200 Garment Factories programme in order to provide much needed employment opportunities to the youth of the area. 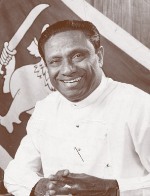 President Premadasa incorporated his house building programme into the war-effort. In 1993 he called me and informed me about his plan for the North, where the military was to launch a big operation. As soon as the military liberated an area, we were to go in and build houses in that area for the people who had lost their homes because of the war. As the first step, he wanted me to build 1,000 houses in the already liberated area in three months. He wanted things done fast because he knew that not having a home can destroy a family and make life unbearable for all its members. As always, this time too, I worked according to his deadline and finished the 1,000 houses in less than 3 months. But by that time Mr. Premadasa was dead. I believe the LTTE killed him because it feared his plans for the Tamil people, and did not want them to succeed. He also planned to have elections as soon as possible, at Pradesheeya Sabha and provincial level, so that people of the North-East could elect their own representatives. The LTTE was opposed to democracy and did not allow free and fair elections in areas under their control. Today the government can show that it supports democracy in word and deed, by holding elections to all elected bodies instead of to a selective few. Having free, fair and fast elections to the Northern Provincial Council is of the greatest importance because devolution is most needed there. Now that the war is over, we have a good chance of coming up with a Sri Lankan solution to the ethnic problem which can satisfy all ethnic groups, which can gain the support of the moderate members of all communities. Tamil and Muslim people must feel that they have enough power to manage their day to day affairs while Sinhala people must feel that national unity is not endangered. A majority of people outside the North and the East do not want or need devolution. Devolution is needed and wanted mainly by the people of the North and the East. We cannot forget that. Devolution is a solution to the ethnic problem and the Sinhala people do not have an ethnic problem. So a solution must devolve power to those who want it. That is why asymmetrical devolution may be the best possible way to come up with a viable solution today. That way power can be devolved or not depending on the need. All the potential in the 13th Amendment has not been fully explored. The concurrent list, as it stands now, is too big and unwieldy. With asymmetrical devolution it can be reduced so that 13th Amendment can become 13th Amendment+. With asymmetrical devolution these extra powers can be limited to the North and the East, since there is no need or demand for enhanced devolution in other provinces. These measures can be implemented immediately, because they do not require a referendum; a simple majority in parliament is all that is needed constitutionally. The Apex Council as an Administrative Bridge between the de-merged North and East. Though the North and the East has been de-merged by a court order, the Tamil demand for merger has not ended. In any serious discussion about a political solution this can become a thorny issue. Setting up an Apex Council to create an administrative bridge between the de-merged North and East is one way out of the problem. The Apex body will consist of an equal number of provincial councillors from the two provincial councils. These members can be selected according to the ethnic composition of the two provinces. The two chief ministers and the two governors can function as ex-officio members of the apex body. The Apex Council can be made accountable to the two provincial councils and the parliament. President Premadasa once said that the past and future of Sri Lanka belong equally to all her people, Sinhala, Tamil, Muslim and others. A successful solution to the ethnic problem will have to be based on such an outlook which treats all Lankan people with equal justice. That is the only way to ensure a lasting peace. And that is the best tribute we can pay to all those who fell victim to the war, including President Premadasa.